The Roman fort of Vindolanda just south of Hadrian’s Wall in Northumberland continues to reap the blessings of its anaerobic, waterlogged soil. Last summer’s dig season was replete with important finds including a cache of 25 writing tablets, but the greatest find was a pre-Hadrianic cavalry barracks from around 105 A.D. in which were found all kinds of utility items from daily life — ink writing tablets, styluses, combs, pottery, wooden spoons, bowls, leather shoes, small wooden swords that were likely children’s toys — as well as an extraordinary group of cavalry weapons, armor and harness fittings. Two swords, one complete with wooden pommel, its edge still sharp inside an intact wooden scabbard, were particularly exciting finds. Among the treasures discovered in the remains of the cavalry barracks were two leather pieces unlike anything else found at the fort. Thousands of leather shoes have been unearthed at Vindolanda. These definitely weren’t shoes. They are elliptical bands which archaeologists and Roman experts have identified as boxing gloves. Dating to around 120 A.D., they are the only known surviving boxing gloves from the Roman era. Unlike the modern boxing glove these ancient examples have the appearance of a protective guard, designed to fit snugly over the knuckles protecting them from impact. The larger of the two gloves is cut from a single piece of leather and was folded into a pouch configuration, the extending leather at each side were slotted into one another forming a complete oval shape creating an inner hole into which a hand could still easily be inserted. The glove was packed with natural material acting as a shock absorber. This larger glove has extreme wear on the contact edge and it had also undergone repair with a tear covered by a circular patch. The slightly smaller glove was uncovered in near perfect condition with the same construction but filled with a tight coil of hard twisted leather. The two gloves can still fit comfortably on a modern hand. They have been skilfully made, with the smaller glove retaining the impression of the wearer’s knuckles. It is likely that the gloves functioned as sparring or practice caestu each has a stiffened contact edge being a softer representation of the of the more lethal metal inserts used in ‘professional’ ancient boxing bouts. It is thought that the larger glove may have been unfit for purpose due to prolonged use and may have survived alongside the ‘newer’ model resulting from a personal attachment given to it by the owner. Boxing was a popular sport in Classical antiquity. It was used to hone and improve combat skills in the Roman army, as well as for general fitness. In addition to regular sparring, boxing matches and tournaments between soldiers were arranged as spectator sports attended by civilians. As of yesterday, the gloves are now on display in the Vindolanda museum. 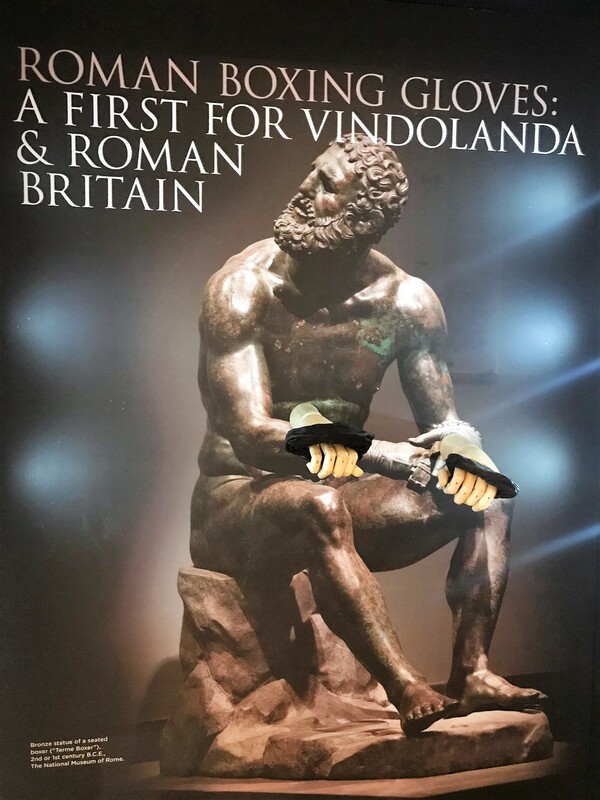 They’ve been fitted onto a pair of mannequin hands and mounted in front of a large image of The Boxer at Rest, a Hellenistic bronze statue posed with begloved hands on his knees in front of him. The mannequin hands are placed in front of the boxer’s so they look almost like extensions of his own. It’s a little… disconcerting, but ultimately I think it’s a good idea to convey how they were worn in antiquity.